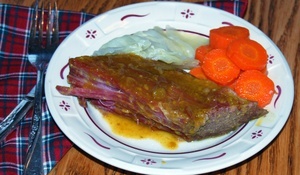 Photo is of Glazed Corned Beef, Cabbage, and Carrots (please note that the plate is a small bread plate size, not a full dinner plate size, as many of you have asked about this). Today I am doing double-duty volunteer sessions (from yesterday's switch-around with Mary Anne), so I am going to do a quick post here and then catch up with you tomorrow when I am cooking in the afternoon...ah, it feels so good to be back in my normal round of activities. No trace of illness left...I need to be more appreciative on a daily basis. Yesterday's meal was great (more on bread success in the comment section of yesterday's post). I tried a new glaze for the corned beef, so I will post that for you today as it was a big success with the guys. Purchase one corned beef brisket, about 3-4 pounds (usually pickling spices are included in the package, if not you will need to add those). Place brisket in crockpot, cover with water, sprinkle in pickling spices. Add 3 onions, peeled and quartered. Cook on low for 7 hours, then add 6 large carrots, peeled and cut in halves. Cook for another 2-1/2 hours. Remove brisket from crockpot, scrape off the layer of fat that is on the meat (discard that), and place the brisket in an oven baking dish. Brush with glaze. Cook in a preheated 375 Degree F oven for 20 minutes, basting with the glaze every five minutes. Slice against the grain and serve. Place all ingredients in a small saucepan and heat on the stove top, stirring occasionally for 5 minutes. Baste the corned beef with the sauce as directed above. Can serve leftover sauce on the side.